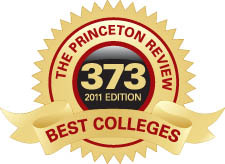 Gustavus Adolphus College is once again rated a top college in The Princeton Review’s guidebook, The Best 373 Colleges, 2011 Edition. This annual ranking, released Aug. 2, 2010, is based solely on input from college students. The educational services publication recognizes 373 colleges in the nation for offering outstanding academics and great campus experiences. Gustavus was also ranked among 152 Midwest colleges that The Princeton Review recognized as “Best Colleges: Region by Region.” As in past years, the publication also gave the College high marks for campus food, ranking it 18th nationally in that category.